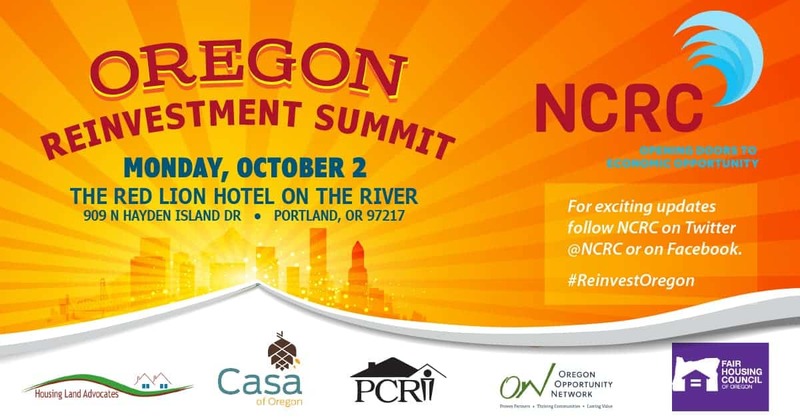 The Oregon Reinvestment Summit, taking place October 2, 2017 in Portland, Oregon, will bring together rural and urban community-based organizations to address Oregon’s affordable housing crisis. The summit will include representatives from fair housing organizations, community development corporations, and policy organizations to explore how to best expand economic opportunities for all Oregonians. Portland Mayor Ted Wheeler will be a keynote speaker. In Portland and throughout Oregon, the cost of housing has increased faster than personal income. This places affordable housing out of reach for increasing numbers of families in both urban and rural communities. The summit is organized by the National Community Reinvestment Coalition (NCRC) with local cosponsors; Casa of Oregon, PCRI, Housing Oregon, Housing Land Advocates, and Fair Housing Council of Oregon.